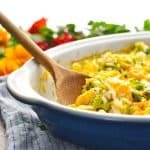 This healthy and easy dinner is also one of those perfect meals that appeals to every member of my family. I love that clean-up and prep work is minimal (thanks to the foil packets), and my kids love the pesto sauce that flavors the fish. 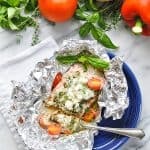 Full of healthy fats and protein, this Mediterranean Salmon in Foil Packets is good for you, but it won’t leave you feeling hungry an hour later. Plus, with only 5 ingredients, it’s so.darn.simple! 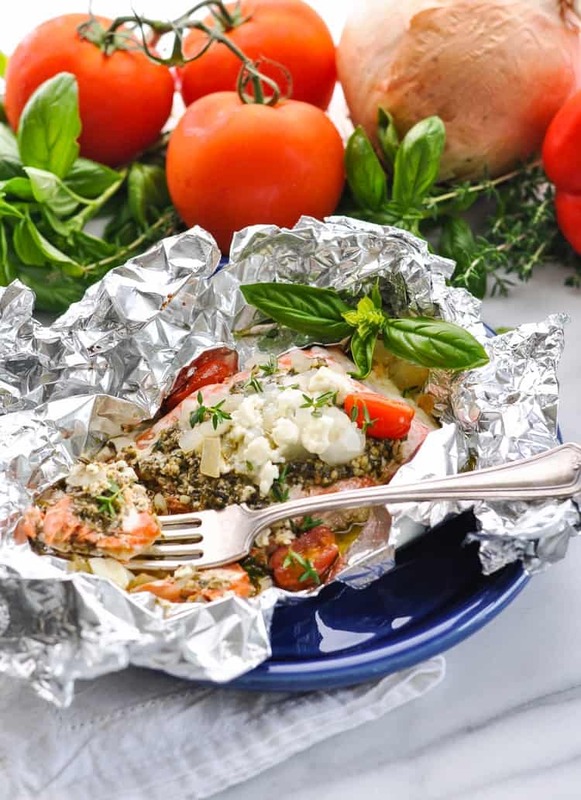 This post for Mediterranean Salmon in Foil Packets was originally published in January, 2014. The photos were updated in July, 2017. 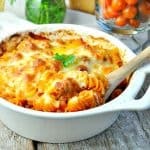 This healthy and easy dinner is also one of those perfect meals that appeals to every member of my family. I love that clean-up and prep work is minimal (thanks to the foil packets), and my kids love the pesto sauce that flavors the fish. Plus, it’s good for us…making it just right for getting back on track in the new year! Love camping? The foil packets make this a a great option for a camp fire as well! 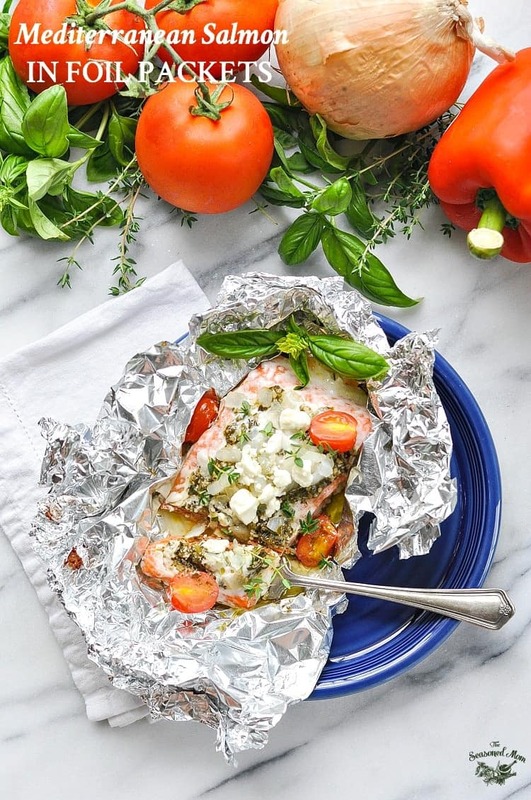 The great thing about this salmon in foil is that it can be prepped in advance. Just topped with you’re desired ingredients, wrap it up and store in the fridge until you’re ready to bake them! Just start by placing each piece of fish on a large square of aluminum foil that has been sprayed with cooking spray. 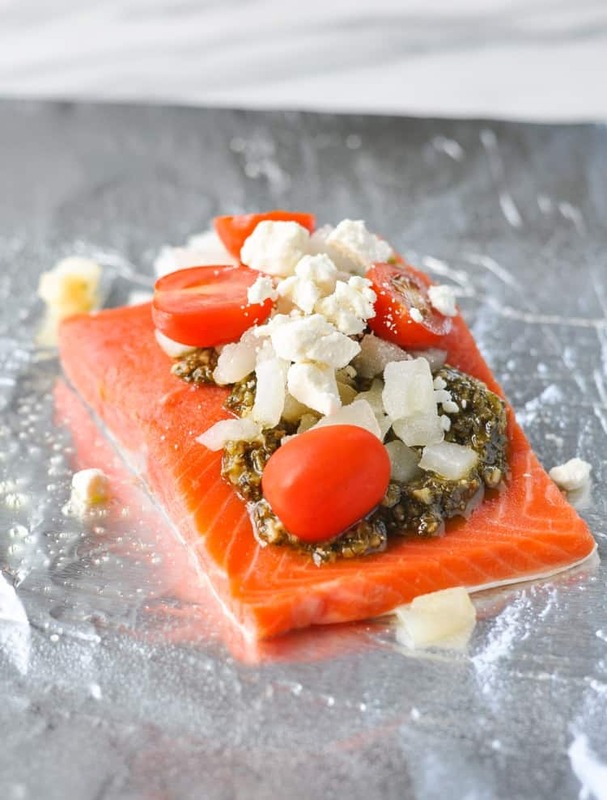 Once the salmon is topped with some pesto, diced onion, tomatoes, and feta cheese, it’s ready to be sealed. Make sure that your packet is completely closed so that the steam doesn’t escape. The individual packets can be placed on a baking sheet and popped in the oven (or cooked over the camp fire) until the fish flakes easily with a fork. 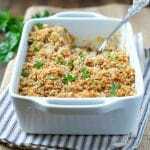 Serve it with some pasta, couscous, or crusty bread on the side, as well as a veggie, and you’ve got a nicely balanced meal. Want to keep it even lighter? Pile your plate high with a salad and place your Mediterranean Salmon on top. Either way, I know you’ll love it (and so will your body!). Cut the ingredients in half, using only 2 salmon fillets. The cooking instructions remain the same. Heat oven to 350F (180C). Spray 4 large pieces of aluminum foil with cooking spray. 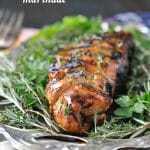 Place each salmon fillet on top of a piece of aluminum foil. 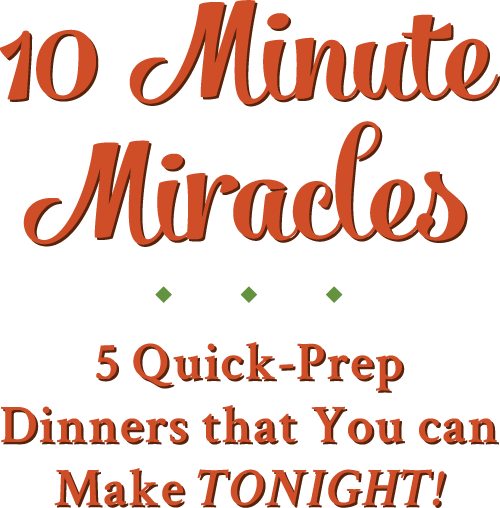 Top each fillet with about 2 tablespoons pesto, ¼ cup of onion, ¼ of the tomatoes, and approximately 2 tablespoons of feta cheese. There's no need to measure the ingredients -- just use as much or as little as you like! 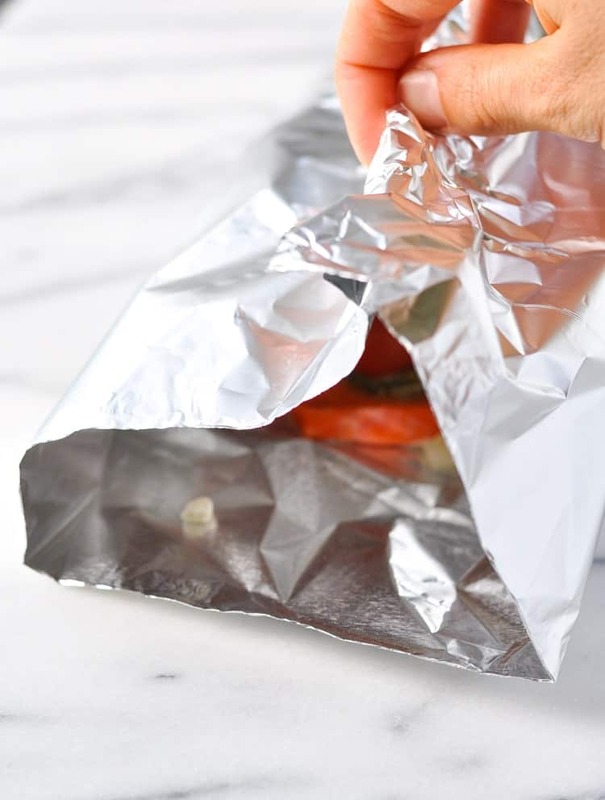 Seal the aluminum foil packets by folding them over the fish and pinching tightly to close. 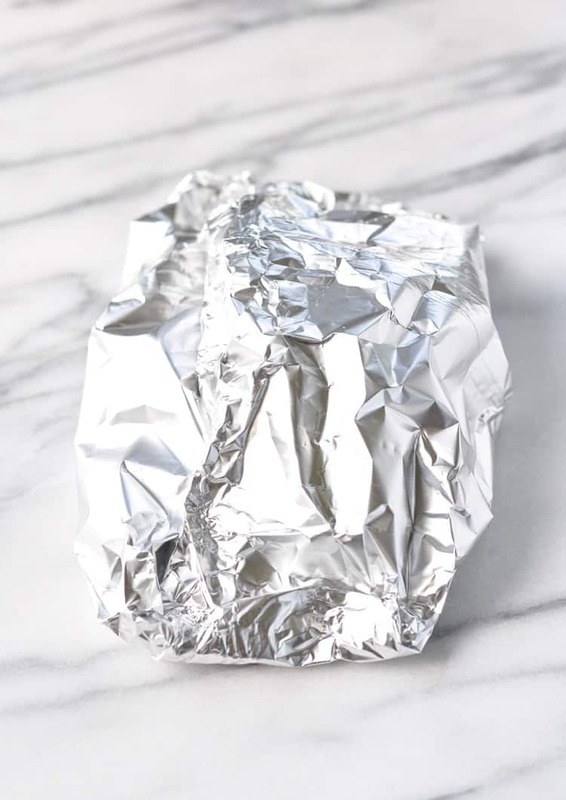 Place the foil packets on a large baking sheet and bake for approximately 25 minutes. Fish is done when it flakes easily with a fork. Cooking Just for Two? Cut the ingredients in half, using only 2 salmon fillets. The cooking instructions remain the same. This sounds so delicious, I bet the salmon is cooked perfectly!